A lot of the people in this one are obviously in the Monitresses picture from 1972 but in that picture hardly any of us are wearing glasses, we had all got contact lenses over the Christmas holidays. The teachers of the Upper sixth came back to a class of teary eyed students thinking someone had died. For some reason I am the only one with my jacket buttoned up. The dresses (sacks) were blue, and the jackets were the horrendous cherry-reds. Finally consigned to the dustbin in 1985. Ah, I saw it on the other thread first and I see this answers my question. 1971 it was. I didn't recognise you as the person with your jacket buttoned, Mary (it was the other Mary I recognised - Mary McD). The jacket looks smarter done up on this photo, but in real life you can't get over the fact that the tunic and jacket don't match and the whole thing looked very bitty. I must say Mary, the person marching immediately in front of you looks really thrilled to be there ! J.R. wrote: I must say Mary, the person marching immediately in front of you looks really thrilled to be there ! For some reason the name Jane Erskine won't leave my mind - was she the blond with glasses behind you? Yes Gerrie that is Jane. Her brother Noel recently joined the forum. Also correct about Susan Halls. englishangel wrote: Yes Gerrie that is Jane. Her brother Noel recently joined the forum. Also not sure about Helen Osborne, in the sense that you are wrong . She was a couple of years below the year in the photo. If you are referring to the person I think you are, then I'm pretty sure it's Lois Shepheard-Walwyn. Yes, that is Lois. Left to right are Susan Halls, Maureen ?Marshall (great alto voice) and Lois. DR vetted all the hair before we went and told us how we should wear it. englishangel wrote: Yes, that is Lois. Left to right are Susan Halls, Maureen ?Marshall (great alto voice) and Lois. How sad is it that I still remember people several years above me, after all this time? And yet I often forget the names of people I've only just met these days. Ah, just had another look and I thought Maureen Murray was the one with short hair and glasses right at the front. I'm sure you're right - you knew them better than I did, after all! Is that Anne Toothill just behind her too? As I said mostly the same people as in the 'mons photo. In rows behind the boys. Anne Verge, Penny Evans, ?, ? Susan Halls, Julia Barton, Juli Bennett, ? Valerie Williams, Alex Thrift, Lois Shepherd-Walwyn, ? Susan Boggett, Mary McDonagh (MKM) ?,? My first reactions on seeing this picture were (1) long hair not tied back, (2) short skirts - obviously the habit of kneeling on the dayroom table to check skirt lengths had been discontinued! and (3) all those beautifully polished shoes. That is an art which I definitely owe to CH training; we were even expected to polish under the shoe, and they were checked each morning as we marched into dining hall for breakfast - hence the habit of buffing the toes on the back of stockings, leaving strange stains on the calves! Knowing how to polish shoes properly came in useful years later when I did a stint in the WRNR - I feft when I was too pregnant with Maria to fit into my uniform skirt any longer! Thanks for posting this photo. I'd like to point out that I am, if not exactly in step, at least no more out of step than anyone else! (I was notoriously bad at marching). YOu seem to be perfectly in step, and concentrating very hard on staying there, Valerie is the one who is a quarter step ahead. Just behind Mary Mc's head (but about two rows behind, on the extreme left), is that Jenny Taylor from 4s? And the girl with the dark fringe, behind Julia Stones - is that Jennie Kirk? 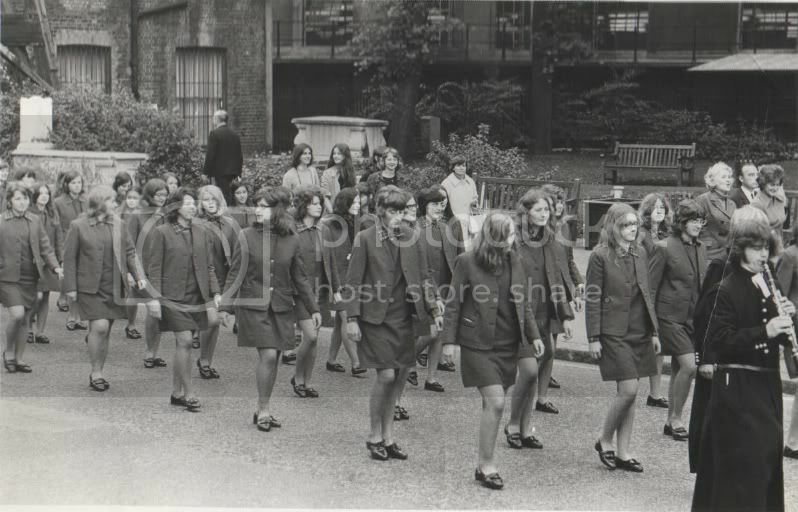 I don't remember the LVI going up to London to march for St Matts - I'm sure I only went in my UVI year. And yet there certainly are LVI in this photo. Have I remembered incorrectly, or was it changed at some point? I was in the first Lower Sixth year to go in 1970, although I was a mon in Lower sixth I think the entire year went (MKM might remember) and clearly they went in 1971, cannot say what happened after that. I know DR thought it very unfair that the choir, band and entire Sixth form went from Horsham and only the Upper Sixth from Hertford before this.